Spring training is less than a week away and it looks like the Blue Jays are pretty close to completing their offseason to-do list. The team has acquired some much-needed middle infield depth, avoided arbitration with several key players, and acquired someone who hates walking as much as Kevin Pillar to play right field. But one piece of business that remains unfinished is the completion of a Josh Donaldson contract extension. While Donaldson has said that he would be “tickled pink” to remain with the Blue Jays, the front office has been unclear about how they plan to handle an extension that would likely cost the currently transitioning team a sum well north of $100 million dollars. With Tulo and Russ Martin’s contracts still on the books and pitchers like Marcus Stroman, Aaron Sanchez, and Roberto Osuna set to start making a whole lot more money through arbitration, the Blue Jays need to get creative if they are planning to dole out over $20-million per season to their star third baseman. The ensuing bidding war that would occur if Donaldson hits the free agent market means the Jays best bet is to get him to agree to an extension sometime before the start of the season. Money talks, and there’s no way around it – the Blue Jays have to commit a significant amount of their yearly payroll to a Donaldson extension, but if the front office can get savvy there may be several soft factors that convince Donaldson to sign an extension with the club instead of testing free agency next fall. Jose Bautista, the now-departed face of the franchise, isn’t just leaving a leadership void in in the clubhouse, he’s leaving a sponsorship void in the market. If JD re-signs in Toronto, he will be able to augment his salary by earning significant money through various endorsement deals. Because the Maple Leafs’ star players are too young to endorse most products, and without having to compete with stars like Aaron Judge or Mike Trout, Donaldson can cash in off the field by lending his likeness to a variety of different products. 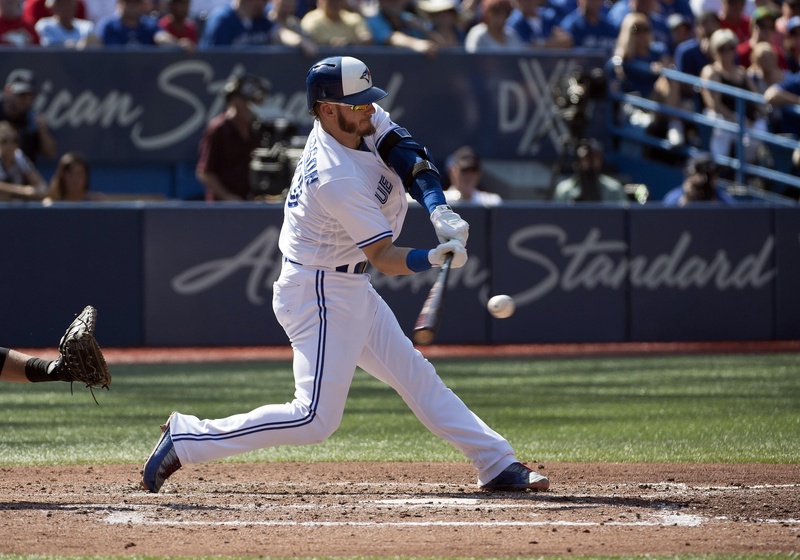 If he decides to go the conventional route, Donaldson can endorse products similar to Jose Bautista – Booster Juice, Pizza Pizza, and Canada Goose parkas. If he’s looking to remain true to his own brand identity he can partner with companies like the Toronto Zoo for a ‘Josh Donaldson King of the F*(&ing Jungle’ night, Garnier/John Frieda bleach blonde hair dye, or Josh Donaldson branded Viking refrigerators. Late last season, a rumor circulated that the Cardinals were interested in acquiring Donaldson. Well, yeah. Who wouldn’t want to acquire a power hitting third basemen who plays great defense? This is the baseball equivalent of saying a bunch of people are interested in winning the lottery. While the rumor might not mean a trade is likely to be consummated, it might be in the Jays advantage to threaten Donaldson with a trade to the Cardinals. Despite a strong record of success on the field over the last decade, the Cardinals are in a lot of ways, awful. They’ve sent out sexist tweets from the team’s official account, invited controversial figures to speak at their annual “Christian Day at the Ballpark,” and their supporters are notoriously vicious. Most recently, fans lashed out at Jason Heyward, who played for the Cardinals all of one year, when he signed with the Cubs for less money. Yuk. Don’t put it past Mike Matheny to bench Donaldson and start Jedd Gyorko if the AL MVP is having a bad week, either. The looming threat of having to play in St. Louis, even if only for one season, should be reason enough to make him sign his name on the dotted line. Donaldson turned 32-years-old last December. While JD is by no means old, professional baseball players his age can start to suffer from age-related injuries and decline in performance. The United States is once again embattled in the perpetual debate over if and how to provide health care for its citizens. While an athlete of Donaldson’s status should have no problem paying for top-notch healthcare, if he signs with an American team, he’ll have to spend more of his hard earned money to get it. Given Donaldson’s recent history of calf injuries, treatment from a calf specialist may not be covered in even the more expensive private insurance plans – you gotta read that fine print. Staying in Canada means Donaldson gets to spend less of his money on health insurance and more of his money on ringside UFC seats. If teams in Texas can sell players on the low tax rate, Mark Shapiro and Ross Atkins should do the same with Toronto’s low healthcare costs which, despite what Jose Bautista might say, do include eye examinations. If the Blue Jays’ front office determines that payroll limitations prevent them from offering Donaldson the highest average annual salary, it doesn’t mean they can’t get creative. Similar to the St. Louis Cardinals offering Albert Pujols a stake in the team’s ownership during his 2011 free agency, the Jays should offer Donaldson Rogers Communications stock. If Donaldson receives Rogers stock he can set himself up for yearly dividends after his playing days are finished, reap the profits of the team’s success on the field, and feel a little better knowing that when the team does exercise financial restraint, the savings should be passed along to his own bottom line. If this is not to Donaldson’s liking, the team can also offer the lucrative, rarely used negotiating tactic of letting Donaldson rename the ballpark – something Rogers has been reportedly discussing for some time now. If the Bringer of Rain Centre is what keeps Donaldson in a Blue Jays uniform for the next five years, so be it. Despite the potential for a lucrative payday, impending free agency does come with distractions: Your contract status can become a disruption in the clubhouse, John Heyman won’t stop bothering you on twitter, you don’t know if you should renew your Canadian phone plan (I’m almost certain Rogers isn’t giving them any deals), and you’re constantly checking to see what kind of year Manny Machado is having. And Daniel Murphy. And Adrian Beltre. And maybe Vlad Jr. But not Pablo Sandoval. Signing a nine-figure extension with the Jays removes all of these unwanted distractions and enables Donaldson to do something even rarer than winning an American League MVP award – own a detached house in Toronto. So here’s to hoping the Jays can find a way to keep one of the best players to ever put on a uniform in Toronto through the end of his career. We’d be tickled pink to have you here too, Josh. Fun fact: MLB players get lifetime health insurance the moment they put on a big league jersey.